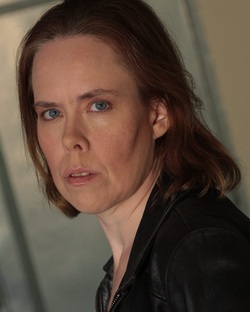 Maria Olsen is a renowned and much loved actress who has pretty much cornered the market in the horror film industry. Her work is prolific - a brief look at her IMDb profile will show you just how prolific. And now she is turning her hand to writing. She is one of those rare authors whose style seems to be wholly natural as though writing is effortless for her. I would go a long way and give much to be able to emulate her composition and flair. Below is Maria's film making biography. Maria Olsen came to America in January 2005 and hasn't taken time to breath since she got here. In eight short years she has performed in 15 stage plays (including one Off-Broadway), directed 3 plays, written and directed her own play and first feature film, shot at least 40 feature films, 70 shorts, 10 web series, 10 music videos and recorded 5 voiceover gigs. She has also won four awards (including awards for both acting and directing), had two short films appear at the 2009 Cannes Short Film Program, one at the 2010 Sundance Film Festival, and became a proud member of the Screen Actors Guild in March 2009. Best known for her appearances as Mrs. Dodds/The Fury in Fox’s Percy Jackson & The Olympians: The Lightning Thief – where Chris Columbus directed and Pierce Brosnan and Uma Thurman starred - and as one of the Paranormal Activity 3 witches, Olsen’s features and shorts have also screened at other international festivals such as Sundance (Renegades), the Fangoria Weekend of Horrors (Justin Paul Ritter’s A Gothic Tale), HorrorFest (Patrick Horvath’s Die-ner (Get It?) - where she won Best Supporting Actress for her role as Rose the Waitress - and the International HBO Latino Film Festival (Sam Benavides’ Mansfield Path). Features The Mudman and Blue like the Morning are currently collecting awards on the festival circuit, while The Haunting of Whaley House, Dragonquest, Die-ner (Get It? ), Alone Together, Vile, DisOrientation, IJE: The Journey, Darkening Sky, Shellter, Embers of the Sky and Humanity’s End are now all available on either DVD or VOD. She has also recently completed shooting on several further features, including Rob Zombie’s The Lords of Salem, Mark Edwin Robinson’s The Levenger Tapes, RD Shalit’s African Gothic, Justin Calen Chenn’s Folklore, Jason Bognacki’s Another, Carl Lindbergh’s Bunnyman 2, Claudia Damasceno’s Feed Me and Jose Figueroa’s San Francisco 2177. Future projects include Craig Ouellette’s road-trip horror Straight On Till Morning as well as the gritty crime drama Cockroaches and the hilarious comedy The Natural Disaster. Thanks must go to her amazing agents and managers, especially Bonnie Howard and Ileane Rusch, for wanting to represent her and doing it so well. Olsen also owns the ultra-cool production company MOnsterworks66, producer of features such as Brandon Scullion’s Live in Fear, Randal Kamradt Jr’s Faraway, Eric Michael Kochmer’s Way Down In Chinatown, Bert Havird’s Reunion and Christopher Dye’s Something Sinister, TV/web-series such as Edward Payson’s Sunday Night Slaughters and Patrick Griffin’s Our Zombie Mother and the podcast/radio show Barry Morgan’s 1313 Blood Lane.